Shopping for a college is sort of like shopping for a new car: Hardly anyone pays the full sticker price. And for good reason. Those prices have been surging like crazy for decades, vastly outpacing the overall inflation rate. Over the last 30 years, published prices for college tuition and fees have risen nearly 500 percent, according to data from the U.S. Bureau of Labor Statistics. Over the same period, the overall inflation rate only doubled. But lately something has changed and the rise in college prices have slowed significantly. The College Board, a nonprofit research group, issued its annual update on college pricing this week, finding that published tuition and fees at private nonprofit and public four-year colleges rose just 1.9 percent and 1.3 percent, respectively, in the most recent academic year. The relatively small increases in the sticker price of a four-year degree confirms a recent slowdown in college costs seen in other measures. The college tuition and fee inflation data published as part of the U.S. Consumer Price Index has fallen to some of its lowest levels on record in recent months. In September, the CPI measure of tuition and fees rose just 2.1 percent compared to the previous year, far lower than the average 5.3 percent annual increase over the last 20 years. That decline is being driven by a slowdown in the price of four-year public colleges, where the majority of American full-time four-year students go. During and after the Great Recession—which lasted from late 2007 to mid-2009—states facing budget strains raised published prices. But such policies met with fierce political backlash, prompting tuition freezes at state schools nationwide. That backlash seems to be spreading to the smaller private nonprofit sector, with a number of smaller institutions recently launching “tuition resets,” aimed at emphasizing affordability. But it’s important to remember there’s a big difference between published sticker prices and what American families actually pay. That’s because in the U.S., we sell college degrees like cars, slapping sky-high sticker prices on them, with the understanding that students and families will end up getting grants, tuition assistance, and scholarships that drastically lower out-of-pocket spending. From that perspective, the best measure of what students and their families actually pay is so-called “average net price,” which factors in such assistance. For public schools, the average net price of tuition and fees for an in-state student was up 3.2 percent the most recent academic year, to $4,140. Including room and board, it was up 1.8 percent to $14,940. For private schools, the net price of tuition and fees was up 4.6 percent to $14,530; including room and board, the price was $26,740, up 3.1 percent from the prior year. 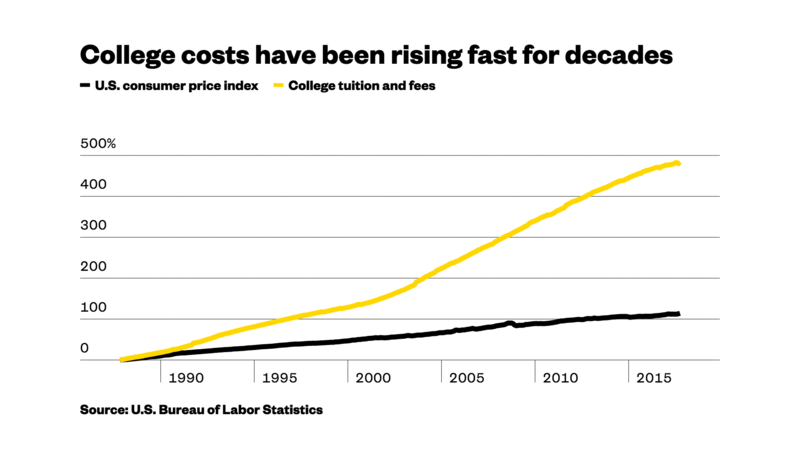 While those actual prices are less staggering than the sticker prices, over time, the song remains the same: costs of attending college have vastly outpaced household incomes. For example, the net prices—including tuition, fees, and room and board—at private nonprofit schools were up 29 percent over the last 20 years, according to the College Board. At public schools, they were up a much more significant 69 percent. Meanwhile, U.S. median household incomes rose just 9.1 percent in 20 years to 2016—the most recent data available. The result can be seen, in part, in the rising share of households with U.S. student debt. Last year, 45 percent of American households headed by those 35 or younger were carrying student loans averaging $33,000, according to data from the Federal Reserve. In the late 1980s, just 17 percent of those households had student debt.